The 2400M Series is capable of a switching frequency in less than 500 microseconds, making the 2400 ideal for test applications demanding high throughput, such as antenna characterization, T/R module evaluation, or RFIC manufacturing. In addition, the 2400''''s low phase noise makes it suitable for serving as a low jitter clock as well as a source for low noise frequency conversion. High output power and excellent spectral purity add to the 2400 standing as the best value in a general-purpose synthesized source. 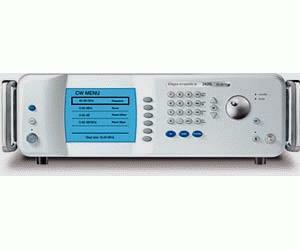 In addition, the 2400M/AM models all include an option for Giga-tronics Automation Xpress Interface (AXI). The AXI, for use with Giga-tronics Automation Xpress software, enables 2.5 ms CW Frequency/Power switching, making the 2400M Series one of the fastest switching synthesizers in its class. The optional Automation Xpress Interface provides faster data exchange and functional downloads/executions, as well as a stable API programming interface for the ATE programming environment.